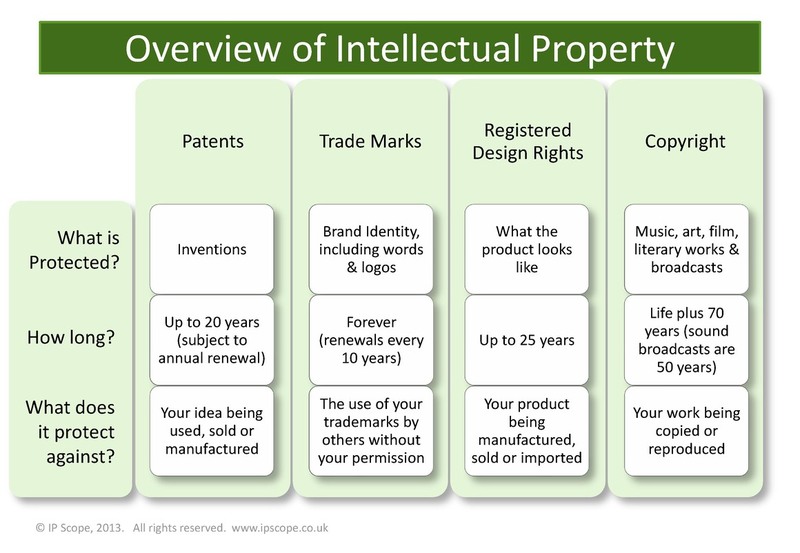 Intellectual property (IP) is a legal field that refers to creations of the mind such as musical, literary, and artistic works; inventions; and symbols, names, images, and designs used in commerce, including copyrights, trademarks, patents, and related rights. Under intellectual property law, the holder of one of these abstract properties has certain exclusive rights to the creative work, commercial symbol, or invention by which it is covered. Economists estimate that two-thirds of the value of large businesses in the U.S. can be traced to intangible assets. Likewise, industries which rely on IP protections are estimated to produce 72 percent more value per added employee than non-IP industries. Intellectual property rights are a form of temporary monopoly enforced or supported by the state. Intellectual property rights are usually limited to non-rival goods, that is, goods which can be used or enjoyed by many people simultaneously—the use by one person does not exclude use by another. This is compared to rival goods, such as clothing, which may only be used by one person at a time. For example, any number of people may make use of a mathematical formula simultaneously. Thus the term intellectual property itself generates some objections based on the argument that property can only properly be applied to rival goods, so there is some internal conflict in the expression since one cannot "own" property of the non-rival kind. Since a non-rival good may be used (disks may be copied, for example) by many simultaneously and,if produced with minimal marginal cost, so producers would have no incentive to create such works. Monopolies, by contrast, also have inefficiencies because producers would charge more and produce less than one might judge the situation warranted. I have issues with aspects of the reproduction of an original work, whether it be book, music or video. While it is so easy to publish material to the web it is also very easy to re-produce material. I have done something similar above, taking Wikipedia’s entry—itself generated by the efforts of consensus—and adapting what it says to my own style. What then is the issue? I am definitely offended if I write a book and the whole book is reproduced with no gain to me (or my publisher, who I rely upon to collect monies on my behalf). I get very loud here in China on the subject of cloning textbooks. I am deeply offended if music played by St Breward Silver Band is copied without the band receiving its three pennyworth of dues (and in turn the band pays the authors of the music their halfpenny share. Yes, it does). If I had a lesson recorded (not that I can think of any worthy of the effort) I would want reward (to me or my employer or both) for allowing that, because in effect someone is having the lesson without paying for it. In the same way, I mind if material here is used for gain and reward to the user but without similar gain to me. I feel differently about working for gain. I understand and agree that if I am employed to have ideas—to produce intellectual property—then the deal with my employer is that I am rewarded in my pay and other opportunities for generating material that my employer then possesses as intellectual property. Fame and fortune, or maybe fame for me and fortune for my bosses (or the other way around, sometimes). They also take the risk in my not producing good stuff. If I was employed as a performer then my pay might be a share of the ‘take’ for a performance and there might be an element of entrepreneurship, but the end result is pay for work. If that performance is recorded and then used for profit, I (would) want my share. We have a curious business around the world caused by the last little part of that argument. If I acquire a copy and no-one gains, did someone lose? Well yes, because if I am the end-user, I should have paid for the consumption (listening to the music, looking at the picture, watching the video, using the software). We have a problem with the case where one is establishing whether a sale would take place. I think here of the people who say that if the thing (film, book, copy in general) was not available for nothing, they wouldn’t avail themselves of the opportunity. But then the same person will spend an inordinate amount of time searching for that ‘free’ thing. A slippery slope, indeed. The world in general is somehow conning itself that if I can acquire a copy and I am the only beneficiary, then this is ok, but if I acquire a copy and make gains by providing this same material to others, this is grossly not ok. I agree that the second is wrong, but I am unsure that the distinction is so easy. There are two issues, then—for those who have lost the thread, that is whether any gain is intellectual or monetary—and to avoid the problems of an inclusive ‘or’, let’s redefine the issues as being either <monetary and not> or <intellectual and not>. The clearer, easier argument is for that of the non-intellectual gain – straight money issues, where I put myself firmly in the camp that describes this as payment or theft, depending whether you cough up or not. The hard nut to crack is that of the intellectual gain, in the context used here meaning the intellectual gain from enjoying the performance, watching the film, listening to the tape, etc. I have come across people who say the equivalent of “let me read the book and I’ll tell you if it is worth the price” – which they have no intention of paying, as if they thinking they are providing the value of the book in return for their opinion. That is what you do in a bookshop: establish whether you want to read the whole of a book, buy it and go home to read it. [Except here in China, where class-fuls (full classes) of students will be found sprawled over the whole of a shop, reading as much as they can, with no intention of paying for anything, ever.] The situation is different on the net, where the bookshop equivalent has no till area. If you are an academic user, this is not quite so – think of the cases where you can find a synopsis akin to advertising, but cannot read any of the original without having some academic pass, membership or by paying a fee. Well and good, say I, provided the blurb is accurate, which it all too often is not, at which point I reverse my opinion, but cannot see a solution unless one can read a larger sample than sales guff. The critics of the process of acquisition of intellectual property have my vote only in so far as they may succeed in doing down the leeches. Perhaps the question becomes less of a problem the moment the intellectual property becomes tangible. (Which is almost self-defeating). Is the performance everyone’s until it is saved to disk, rather like listening to a radio but not recording the programme? Is the story everyone’s until it goes into print? I’d include it being on the screen, here, but how can you have a story without something to read? Is the use of video already at the point where any transfer of ownership by copying must be an offence to the originator? Does anyone want to distinguish between single-use rights and ownership of a copy? Have a look at some of the electronic book-readers, then, where several are selling a one-read (read once) use of a ‘book’. Who owns a photograph? If I take a good photograph of a person, then what is the extent of their ownership of that snap? If you take a photo of me, do I own an interest in it? (I hope so, ‘cos I wouldn’t generally give permission to use a photo of me). How does the situation change if the photo is of my car, my house, my land? Do I owe someone if a photo of a sunset wins a competition because their land is in the foreground? How is the press somehow excused from all such issues? Oh dear, I’m going to have to research this some more, having questions without answers. Is that an equivalent to Songs without Words? How do you feel about finding a money note on the street? Is that in any way the same as finding an electronic book (say) available on the net? Should one distinguish the way in which it might be ‘available on the net’? Does your opinion change if you have paid in any way for the use of a site? Does a thief persuade himself that if he can reach a possession of yours, you have made it available in some generous sense? edited a little 20091212 and more on 20100108. I need some reader response !! No response whatsoever and more added 20100824. Hit counter added 20110126 and lost mid 2012. Small edits 20161201. Subsequent reading resulted in essays on 195 copyright, 153 digital newspaper, 194 ebooks.